Two-piece 2-7/16x1-5/8x13/16" Gold Embossed Foil Jewelry Box is white inside with non-tarnishing synthetic cotton fill. High Quality boxes - Value Priced. Made in the USA. Great size for small items like earrings & pins. Many sizes are available in these versatile jewelry boxes. All boxes are filled with non-tarnishing ultra white synthetic cotton. 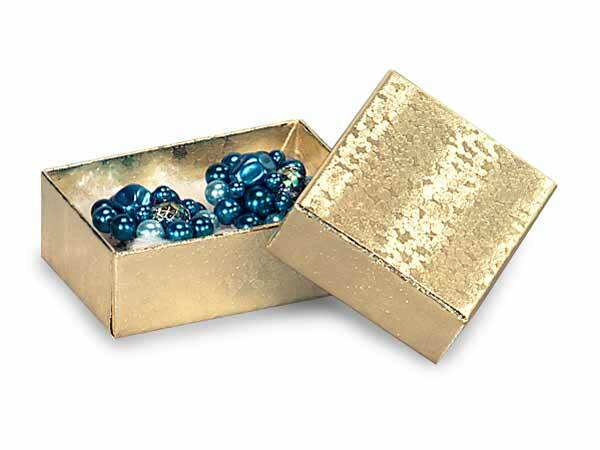 These boxes are great for jewelry and small gifts. Packed in cases of 100, all are 2-pc. rigid set-up boxes. Pre-packed 72 box assortments in gold or silver are also available. Made in the USA. Jewelry boxes contain 100% recycled boxboard which is the largest component of the box by weight; the total recycled paper content is approximately 72% including coverings.